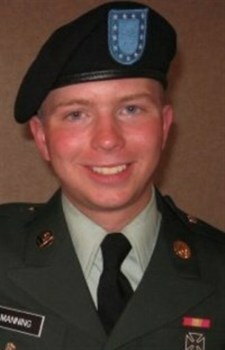 What should happen to PFC Bradley Manning, the young man now charged with the unauthorized access of and subsequently leaking of classified military information, namely the video that Wikileaks released under the title “Collateral Murder”? Should the United States government execute him? If your name is Congressman Mike Rogers, then you believe that yes, the young man should be put to death. The congressman, appearing on a local radio station in Michigan, said that Manning’s actions (still alleged at this point—he hasn’t been convicted yet) qualify as treason in a time of war, and thus should be considered capital crimes. That is, crimes punishable under pain of death. You ought to listen to the entire interview (it’s available online, and it only 17 minutes long) before forming any opinion on what the congressman said. I’m not a fan of taking a few words here and there, presenting them out of context, then claiming that the sky is green. One odd thing: Rogers seems to be working under the assumption that Manning, who has sizable support online, was also responsible for the Afghanistan war logs. To my knowledge Manning is only in custody over the leak of the “Collateral Murder” video, and not the war logs. Not yet, at least. The congressman, who represents Michigan’s 8th district and who sits on the House Intelligence Comittee, said that if Manning isn’t charged with treason then he should be charged with murder. Why is this on a tech site? Because Wikileaks is testing the very barriers of information and access and, as such, is an important story in both the science and art of fact gathering. The site has recently joined Flattr, the online payment system started by Pirate Bay co-founder Peter Sunde. The idea is to setup a Flattr account, maintain a monetary balance in there (currently, the beta’s minimum is 2 euros per month), then every site you “Flattr” (sorta like clicking on a Digg or Retweet button on a site) gets a piece of that minimum balance. The point is to help prevent the type of funding shortfalls that the site has run into in the past. Now, funding the freedom of information is as easy as Flattr-ing the site. Again, you can listen to the interview yourself and form your own opinion.